This auction is for a Wallis Top Pink Blue Stripe Semi Sheer Button Up Tunic Sleeveless Blouse Size 16. It has been washed and worn but is in good condition although there is a very small mark on the front(see pic) and the split hem at the sides has had a repair(see pic). It is slightly sheer so would need a cami underneath. The measurements are 22” pit to pit and 31” shoulder to hem. Please feel free to email me with any questions. White with fine grey stripe, will look equally well with black, navy or grey skirt or trousers. Three quarter sleeve with comfortable cuff which has no buttons to fasten. Very smart fitted style. 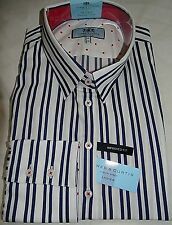 UK6 Next striped blouse/shirt, excellent used condition. TM Lewin Woman Tailored Black/White Stripe Shirt Size 14. Excellent condition only worn a couple of times. Chest 38” (approx). PayPal only - will combine postage (please message via eBay only). Payment within 2 days of auction ending please. UK Dispatch only. 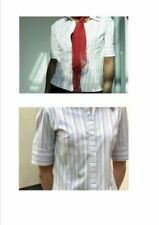 WAREHOUSE WOMENS STRIPED OFFICE SHIRT. SIZE 12. USED. Really lovely and unusual size 8 Next cotton shirt. Great condition. 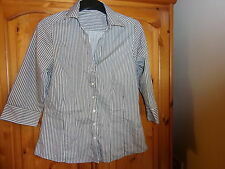 Ladies Dark Grey & White Very Fine Striped Fitted Shirt By H&M. Size 10. A crisp cotton shirt/blouse in pinks and blues from Hawes and Curtis (Jermyn Street, London.) Semi fitted. Size 8 Perfect condition - clean and fresh from a no smoker home. THIS IS A WHITE AND BLACK FINE STRIPED STRETCH BLOUSE FROM M&S COLLECTION IN A SIZE 18. IT HAS A BUTTON FRONT, V NECK, LONG SLEEVES WITH BUTTON CUFFS AND HAS A RUFFLE TRIM ON THE FRONT. 57% COTTON, 21% POLYAMIDE, 19% POLYESTER, 3% ELASTANE. 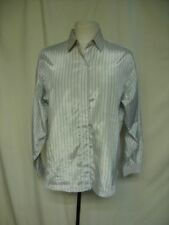 next blue and white stripe long sleeve blouse size 14 new without tags. Dispatched with Royal Mail 2nd Class. Crew Clothing Striped Shirt Size 12. Length 26". Good condition. Fitted Compact Royal shirt. Great fit and quality. Really nicely fitted down the front of the shirt too. Stylish gathering on shoulder to define the look.